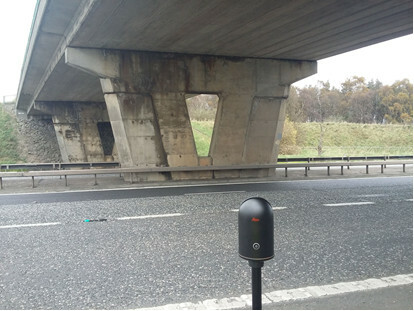 Amey Roads NI (ARNI) has used scanning technology to complete surveys of bridges on Northern Ireland’s strategic road network, saving money and time, and keeping roadworkers safe. ARNI was tasked with building, operating and delivering improvements to part of the strategic road network across Northern Ireland (DBFO Package 2). It is responsible for 540 lane-kilometres of motorway and trunk road, plus 140 bridges and ancillary structures. It employed Amey Consulting to manage the lifecycle risk profile of new and existing highway assets, and to complete surveys of the bridges to plan for essential repair and improvement works, and as part of a regular inspection programme. To address this challenge, ARNI used reality capture technology, the Leica BLK360, to create accurate 3D point clouds and images of its projects. The reference models and 3D scans to supported remedial work and regular safety inspections. Using the scanner and its iPad software, Recap Pro, also simplified the process of surveying bridges. 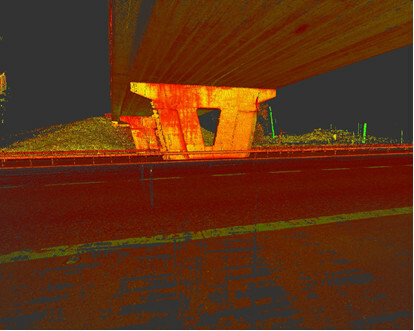 For instance, a single worker can scan the entire underside of the bridge, securing detailed 360 degree, HDR spherical imagery and accurate point clouds in minutes using the equipment. Scan annotations highlight concrete delamination and exposed reinforcement to help identify the exact location and nature of defects or areas of disrepair, rather than needing to interpret site notes, sketches and images. Design teams then use the point cloud in Civil 3D to create surfaces, elevation and section drawings, and plan repair works, including what parts, materials and resources are required. Once repair works are complete, a repeat scan can generate a complete ‘as-built’ record for the health and safety file and can be used to substantiate the completion of works and authorise payments. It could previously cost up to £4,000 to arrange a total road closure needed to complete a full bridge survey, which might be needed on up to 140 bridges. Last month John Jordan, lifecycle project manager at ARNI, was awarded the Amey Consulting Award in the ‘Putting People First’ category for his 2018 work with the BLK360. He said: ‘Gone are the days of handwritten notes and zoomed in photographs that no-one can figure what part of the structure we are looking at.